We can often custom a tour to suit your group if you book in advance. We understand special occasions can call for special additions for example a longer tour with gourmet additions, romantic sunset stops etc. Feel free to send us an enquiry and we will do our best to accommodate your every need! We'd love to be a part of your special day whether it's a hen/stag outing, an unforgettable proposal or anything else, we guarantee your guests will never forget it! Let the rhythm of the rails carry you along through beautiful bush, rock cuttings, villages and fields ...magical scenery with a surprise and a smile around every corner. Deserted beaches stretch for miles as you traverse untouched tracts of the famous Coral Coast. Pedal or simply use your accelerator to cruise along! Designed and built by green inventor extraordinaire Howie de Vries. 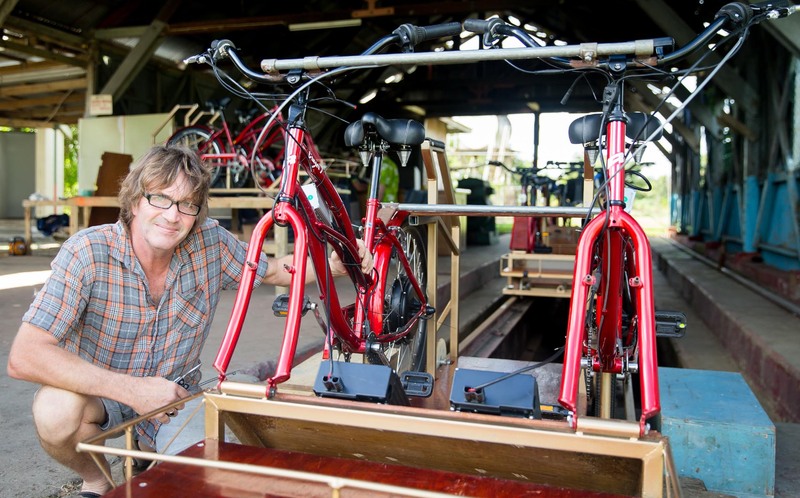 These modern, comfortable, electric-assisted vehicles are essentially modified, rail-mounted pushbikes. They’re suitable for absolutely anyone to enjoy at their own pace… Mums and Dads, the disabled, the super-fits and the unfits, the little kids and the big kids. It’s the ultimate family experience where the smiles come easily as you discover the fun together. There’s some amazing history – Fiji’s sugarcane industry blazed this trail – but nature again dominates our slice of coastal magic and that’s just how we like it. The sea and the land here are close to the hearts of our Fijian crew. They have a genuine love of sharing the stories and sharing in your fun everyday here at Ecotrax. Returning back along the rails you'll know you have done something totally unique and can claim to have seen a part of Fiji rarely accessed. After being taken through the safety briefing from Britney, Krystelle heads off on an unforgettable journey, taking an hours cruise along the coast of Cuvu. Final stop on the Eco Trax Fiji tour - the beautiful Malamala beach!!! Krystelle soaks up the sun and enjoys a delicious fruit platter compliments of Eco Trax.